*This post is presented by Shabby Apple. I’ve been a little bit denim jacket crazed here lately. 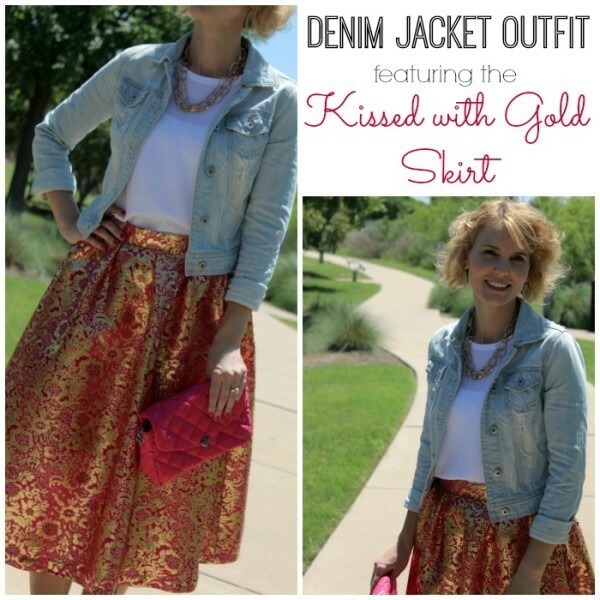 This will be my second post this week on denim jacket outfits, plus I’ve been wearing them out and about like crazy. It’s just such a versatile, easy to wear piece of clothing that helps pull an outfit together. The one I’m sharing with you today has a special place in my heart for two reasons. One, I’ve paired it with a skirt that deserves its own closet and two, I’m teamed up again with my fashion blogging friends. First, drum roll please. This is the skirt of my dreams. 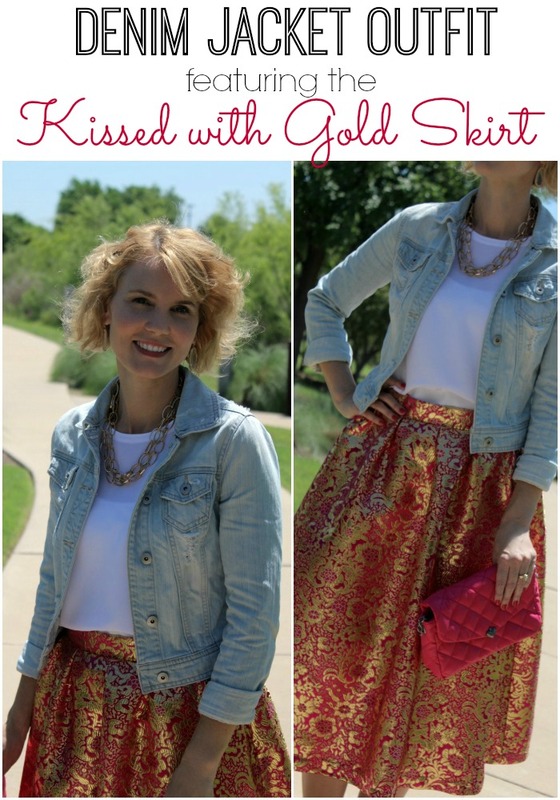 It’s from Shabby Apple and it’s rightfully called the Kissed with Gold Skirt. I can hear you oooohing and aaaahing from here. 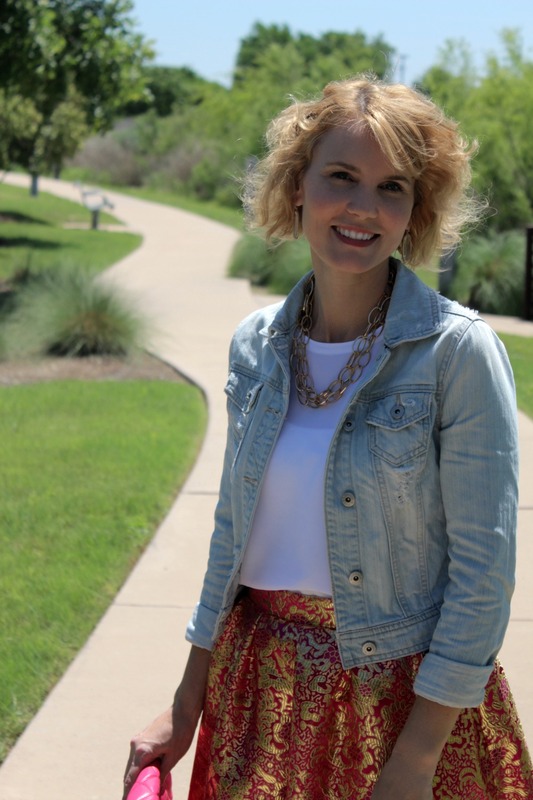 This skirt is a statement maker and pairing it with a denim jacket just seemed like the right thing to do. The skirt elevated the jacket, while the jacket added another element to the skirt. If you have a skirt that you’ve been dying to wear but it just feels too dressy, try this look. How did my fashion friends elevate their denim jackets? Take a look at their blogs and get 10 more denim jacket outfit ideas! What? You want to see more pictures of this glorious skirt? Here you go. 😉 You can also see what it looks like without the jacket. I love it both ways! Do you have a denim jacket? How would YOU style it? Next articleHave You Ordered Your Student’s Graduation Announcements Yet? It’s Time! 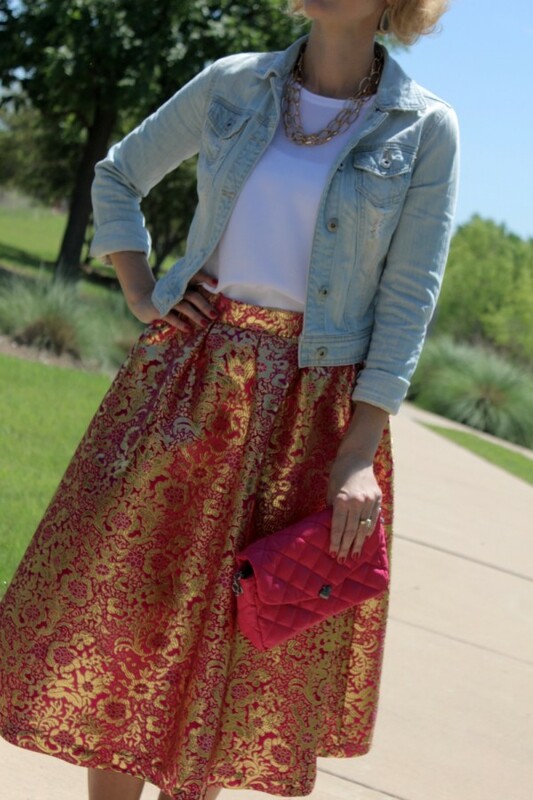 That is a fabulous skirt and it looks so good on you. I love dressing up denim jackets!! 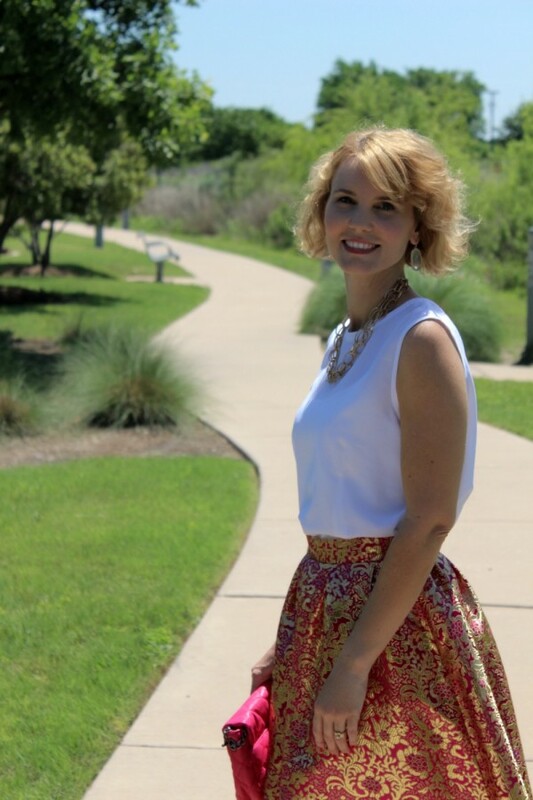 The skirt is so pretty Julie & it looks gorgeous on you. The denim jacket.. I’m in love with. I LOVE this shade and that it’s slightly cropped. I need this!! Thank you so much! I have several shades of denim jackets and I think this is my favorite! Wow, that skirt is perfection! So very beautiful! 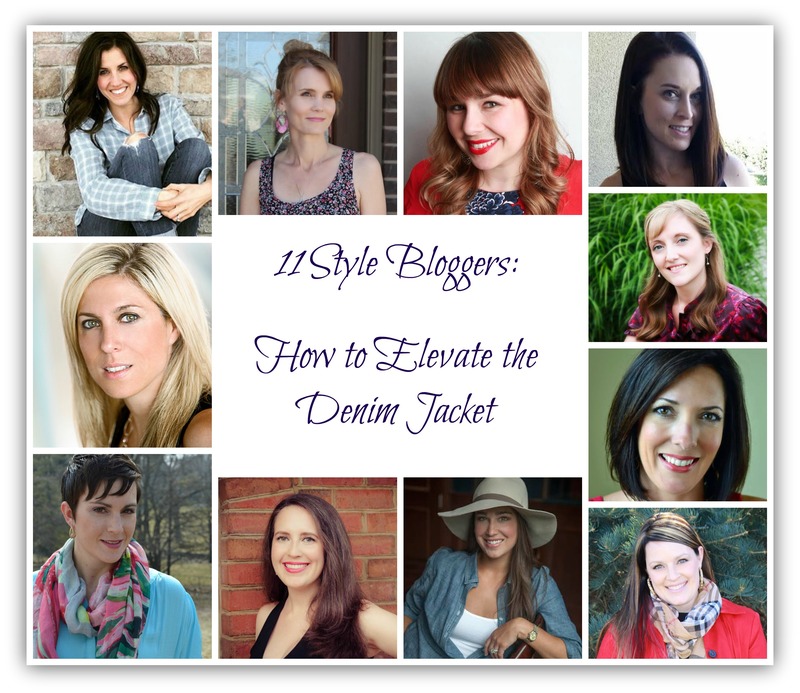 I really loved this denim jacket styling post! SO fun! Thank you Ashley! This was a fun one to do! You look absolutely stunning! What a gorgeous pairing. 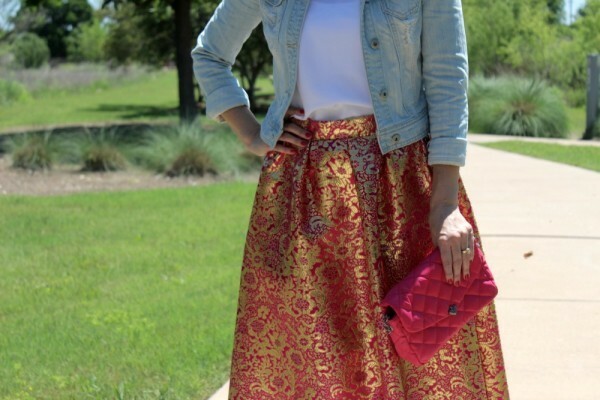 skirt is DIVINE! Love love love it! you look beautiful. Thanks Carly! Loved your look as well. Such a fun collaboration!